The Bangles have never shied away from acknowledging their influences, from British Invasion bands (especially that fab lot from Liverpool) to other girls-only groups like the Runaways and the Go-Go’s. Now with their current album, Sweetheart of the Sun (Model Music Group), founding members Susanna Hoffs, Debbie Peterson, and Vicki Peterson reveal even more of their musical roots while boasting the sort of infectious hooks and harmonies that have long distinguished their sound. Traces of psychedelic pop (“Under a Cloud,” a cover of Nazz’s acidic “Open My Eyes”) juxtapose more organic moments of country/rock (“Anna Lee,” “I’ll Never Be Through With You”), with Hoffs and Vicki Peterson each taking their fair share of the lead vocals. Twenty years after the Bangles notoriously struggled for identity as a band rather than Susanna Hoffs’ backup group, this album is perhaps their most compelling fulfillment of that ambition. Other standouts include the saucy rocker “Ball ’n’ Chain” and a truly sizzling take on the McKinley Sisters' "Sweet and Tender Romance," both tracks brandishing ultra-frisky grooves and stinging guitars. 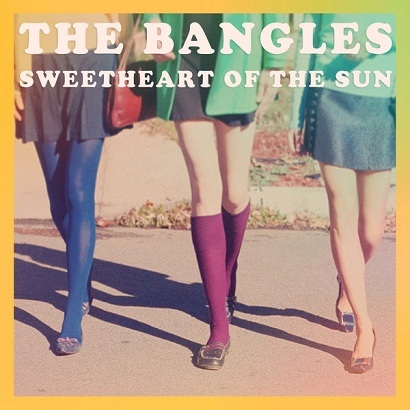 This is good stuff; and thanks in part to co-producer Matthew Sweet–his oldies-revue collaboration with Hoffs has yielded two feel-good volumes of Under the Covers in recent years, with a third album yet to come–the Bangles have come back in a big way.